Bonefish Grill has a Valentine's Day Prix Fixe offer that is available now thru February 17th. For $29.90 per person you can have the Steak and Lobster Duet as well as a House or Caesar salad each and a brownie dessert to share. I love that they are going to be having the special for several days so that you can celebrate Valentine's Day on a less busy day if you choose to (we are celebrating Thursday the 13th because we work Friday the 14th). 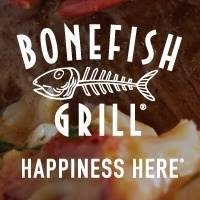 However, if you do want to go on Valentine's Day, Bonefish Grill will be opened for lunch as well. You could plan to have an earlier dinner or special lunch. Be on the lookout for a Bonefish Grill review. I will be visiting and reviewing them soon. I hope everyone has a great Valentine's Day!